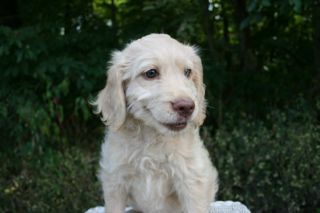 Sapphire's puppies have all been adopted and are now with their families. What an exciting time this was! We are looking forward to updates from the families and will post updates and photos as we receive them. Be sure to check back for news on planned litters. Sapphire gave birth to 10 healthy puppies on March 10th, 2017. She had 5 boys and 5 girls. All are the most gorgeous red. Mom and puppies are doing great and, as usual, Sapphire is an excellent mother. We are very excited about watching these puppies grow. Puppies will be headed to their homes on May 5th. Check back weekly for updated photos and videos. Heartsong Ain't Misbehavin ~ Sapphire Sapphire is our dream dog. She has a very soft fleece coat, beautiful boning, and has perfect conformation. Sapphire looks deep into my eyes when I talk to her as though she is processing my words (and I truly believe that she is). Sapphire has her AKC STAR Puppy Certification. She is gentle beyond words. When she runs, it is perfection. Her favorite thing to do is to run in the woods. Her second favorite thing to do is lay real close while I read or watch TV. Sapphire is apricot in color and weighs 50 pounds. She comes from my foundation line out Tegan Park Flame/Heartsong Ruby (our 4th generation out of Tegan Park). Our beautiful Pearl is her mother. This line is very precious to me and I think she is perfection. This is Sapphire's third and final litter. Tuscan Ridge Rocco Cappuccino ~ Cappy Cappy is 20 inches tall, weighs 47 pounds. Teresa describes Cappy as "darkest red you'll ever see." She says, "he is the life of the party when there are lots of dogs around! He is playful, loveable, and fantastic with kids.... he takes a lot of kisses and hugs with toddlers." Cappy is very red, has great boning, ultra soft beyond words and is definitely therapy material. Thank you Teresa for sharing your gorgeous boy with Heartsong. We are very pleased to announce that Savannah's Teal Ribbon Girl will be joining Jane Markham and her therapy dog Gus as a therapy dog at Jane's school. There she will help children who anxious, shy, or withdrawn to feel safe and comfortable. 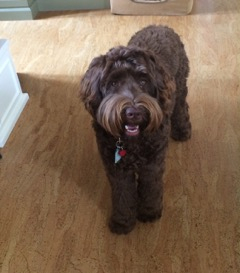 Given her sweet and loving temperament, we think she will make a wonderful therapy dog. Jane and Gus are doing wonderful work at their school and we are so proud that another of our dogs will participate in this work. You can read more about Jane and Gus here. Sparky gave birth to 9 puppies on July 27, 2016. She had 5 girls and 4 boys. Puppies are black, chocolate, and one creme. Sparky is so proud of her babies. She just beams when you come in to look at them. She is also a great mother. Mom and babies are doing great. We think these will be spectacular puppies. 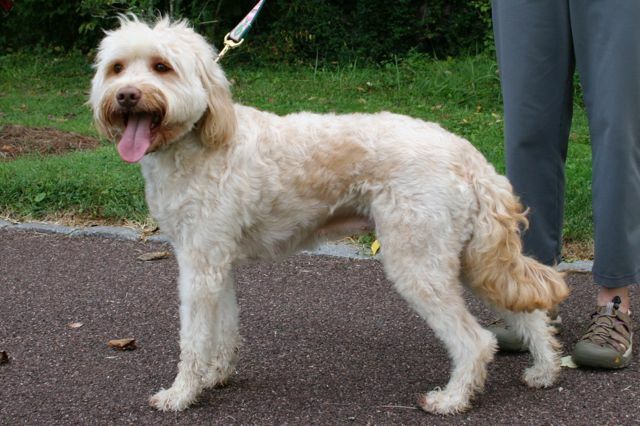 Both parents have gorgeous coats, great conformation, and loving temperaments. Sierra Vista Lil Miss Firecracker at Heartsong ~ Sparky Sparky is owned and loved by Agnes and Brandon. She is a huge hit everywhere she goes! And she goes everywhere! Agnes even takes her to Mass. Sparky is one of those dogs that makes eye contact with great intensity and I expect her to start talking at any moment. Her structure is perfect. She has nice boning, good movement, perfect conformation. She loves everyone, especially Agnes and Brandon. She lived with me for two years so I am her second mom. She has the softest, most beautiful single wool coat. This coat helps her offspring to continue to be low to non shedding. She is incredibly smart and could easily be a therapy dog. Rasa Rasa, who known and loved by is forever family as Milo, is our beautiful boy out of our beloved Georgia and Chance. Rasa weighs 45 lbs, is perfectly balanced and structured, and has his mother's beautiful chocolate fleece coat with golden highlights. He has a comical personality and is very loving. At the vet's office he was friendly with every person and dog that came into the office. It was as if he were the official greeter. 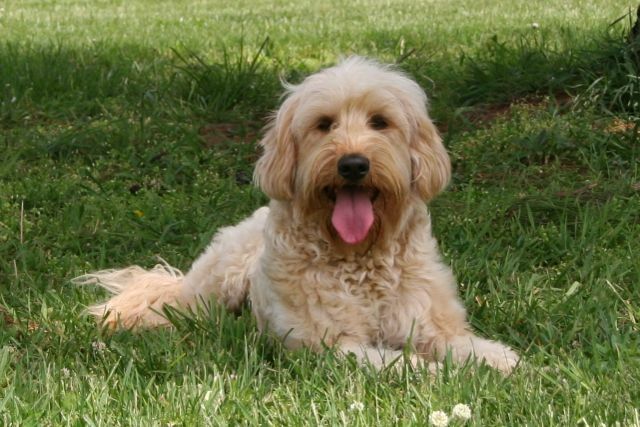 Rasa is out of old Tegan Park and Rutland Manor lines that have produced many therapy dogs. We are very excited to see his first puppies. Savannah gave birth 5 beautiful girls and 3 gorgeous boys on July 20, 2016. Puppies are creme, caramel, and chocolate. Savannah is such a devoted mother. She is taking wonderful care of her babies. Oh my, they are adorable! 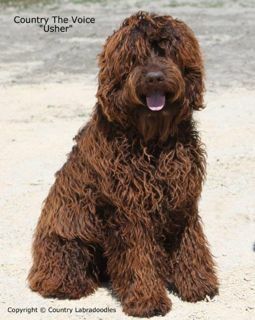 Heartsong Savannah Sunrise ~ Savannah Savannah is a gorgeous girl with the softest fleece coat, gorgeous green eyes and the sought after temperament of the well bred Australian Labradoodle. 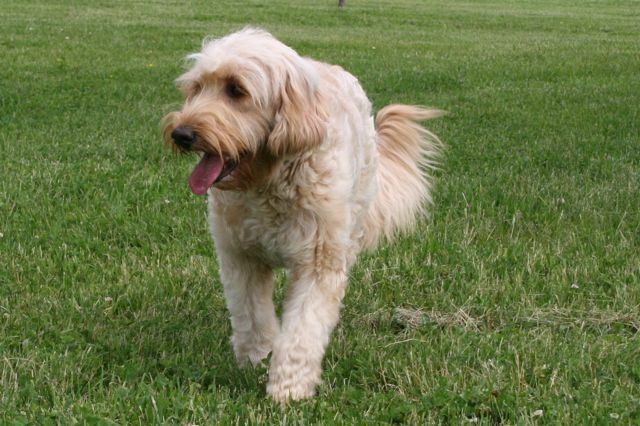 Savannah has caramel coloring and stunning green eyes. She weighs 42 pounds, is very balanced, has great movement, and perfect conformation. She is the third generation from lines we imported from Australia. Her grandmother is our famous Irish Rose and her mom is our beloved Mattie who retired in 2012 after a spectacular career of producing some wonderful therapy lines. 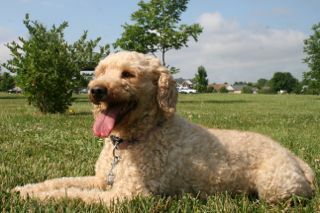 Savannah lives in Louisville with her best friend, Lily, a pet Australian Labradoodle from our wonderful Scottie. Helen, Savannah's guardian, describes her as "Loving, cute, playfully mischievous, and a beautiful blonde." Thank you Helen for taking such good care of Savannah. 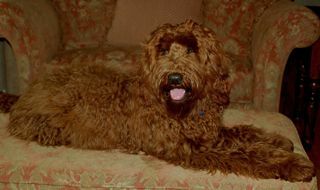 Country Labradoodles Country The Voice ~ UsherElizabeth Ferris, Usher's breeder, describes Usher as 'perfection' and we agree. Usher is loving, athletic, and devoted to his family. 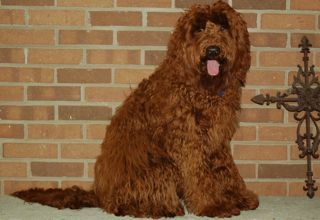 He has great conformation and a stunning dark chocolate, wavy/curly fleece coat. Usher is 23 inches tall and weighs 59 pounds. He has great health scores and ranks in the 90th percentile for PENNHIP, which is very, very good.